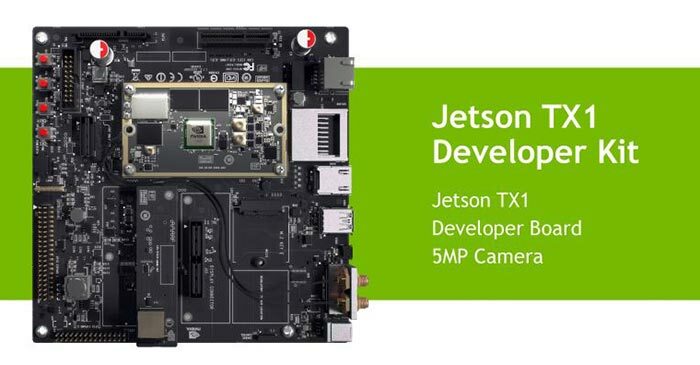 Nvidia has launched the Jetson TX1 Module. The new module is designed to power artificial intelligence (AI) and provide machine learning in autonomous robots and drones, be central to Advanced Driver Assistance Systems (ADAS), and be an ideal solution for mobile medical imaging. 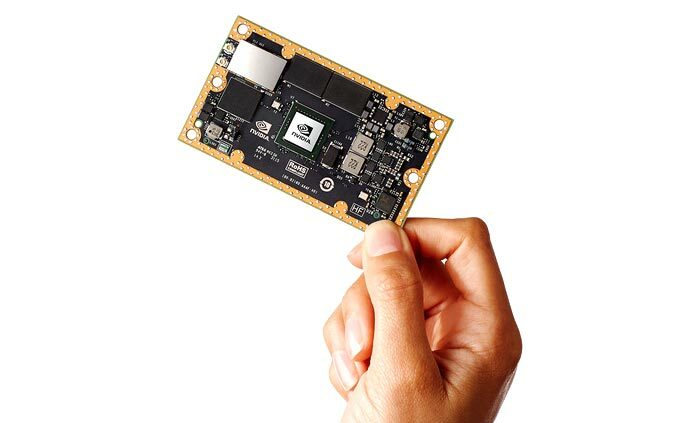 It is claimed that, thanks to its powerful components, the Jetson TX1 is the first embedded computer module that can learn to recognize objects or interpret information. "Jetson TX1 will enable a new generation of incredibly capable autonomous devices," said Deepu Talla, vice president and general manager of the Tegra business at NVIDIA. "They will navigate on their own, recognize objects and faces, and become increasingly intelligent through machine learning. It will enable developers to create industry-changing products". Providing the computing power, to this approximately credit card sized computer board, is a 64-bit CPU using ARM Cortex-A57 cores, and a 1 TFLOP 'Maxwell' GPU with 256 CUDA cores. The Jetson TX1 supports 4K video encode and decode, up to six cameras and can connect to an array of fast/modern interfaces including HDMI, DP 1.2, Gigabit Ethernet, 802.11 2x2 ac Wi-Fi, and Bluetooth. There's 4GB of LPDDR4 (25.6 GB/s) on board and 16GB of eMMC storage which can be augmented with SDIO and SATA connected devices. For essential maker-board style expansion and interfacing Nvidia has kitted out the Jetson TX1 board with 3x UART, 3x SPI, 4x I2C, 4x I2S, and GPIOs. Importantly the Jetson TX1 comes with "the most comprehensive SDK for embedded visual computing," including a CUDA accelerated machine learning library, CUDA accelerated VisonWorks computer vision library and framework, support for OpenGL 4.5, OpenGL ES 3.1 and Vulkan plus support for CUDA 7.0. Nvidia's Jetson TX1 has already garnered heavyweight industry support. Sertac Karaman, a professor of aeronautics and astronautics at MIT, said that "Nvidia's Jetson TX1 is so powerful and easy to use, we decided to base MIT's robotics systems and science course around it". Karaman said MIT students will use XT1 boards' embedded vision, stereo reconstruction and machine learning in research and technology projects. Berkeley Design Technology president Jeff Bier said that developing for the TX1 felt more like PC development than typical embedded board development and praised Nvidia on the ease of installing system images and providing support for CUDA, making harnessing the power of the GPU much more simple. The Jetson TX1 developer kit will become available for pre-order starting tomorrow. It will be priced at $599 in the US ($299 for education customers) with shipping expected on 16th November. The Jetson TX1 module will become available early next year priced at $299 in bulk. For most of us this is a Raspberry Pi for $600, so I for one am out. Shame, as I would love something a bit more powerful than the Pi 2. Won't the existing TK1 work for that?